Happy Thanksgiving! 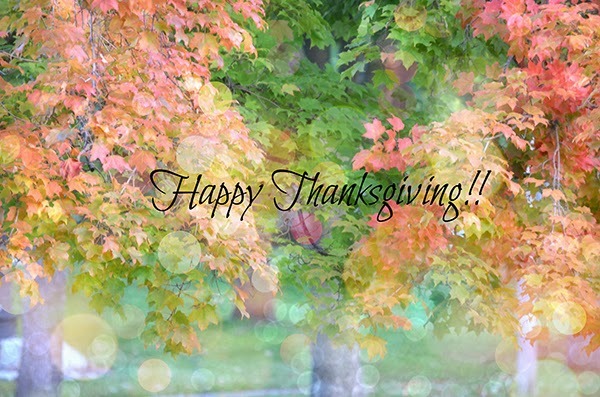 I hope everyone had a wonderful Thanksgiving with family and friends. We just had a small group this year but that's ok it was very nice and relaxing. It's always nice to have a day spent with the ones you love and give thanks for all the many blessings in life. 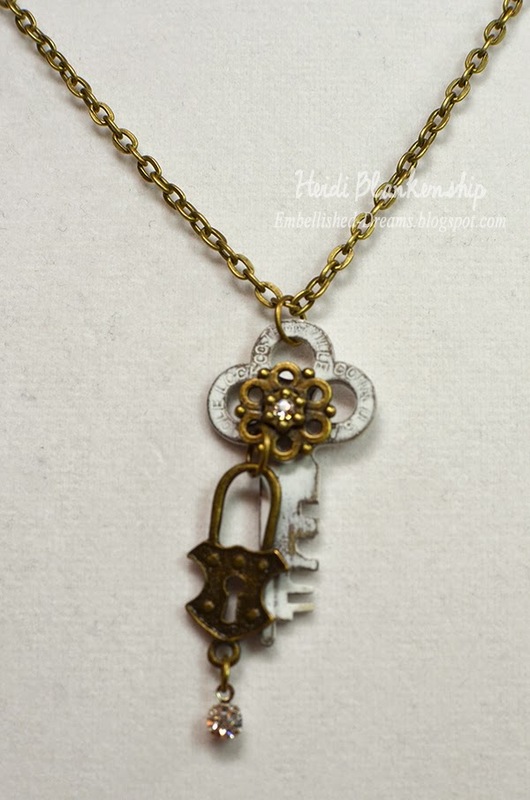 Today, I have some vintage key necklaces to share with you. This past summer when I was at a local antique shop I found a two sandwich sized ziplock bags filled with all kinds of vintage keys. I knew exactly what I wanted to do with then--turn them into necklaces. 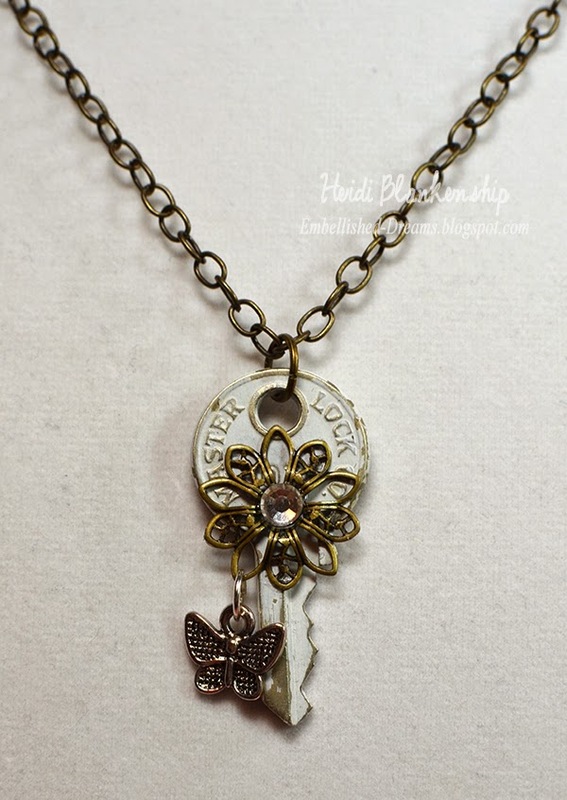 I used several small bits and pieces from metal filigrees to charms and crystals from ButterBeeScraps to embellish the keys. 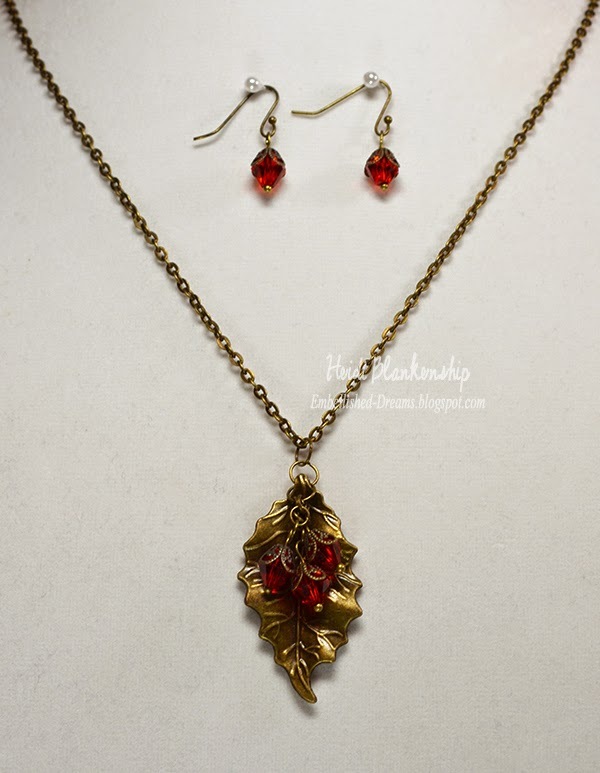 Here is the first necklace. For this one I added some SS8 Crystal Rhinestone Chain Trim, Silver Filigree, Silver Jump Rings, and Silver Chain from ButterBeeScraps. 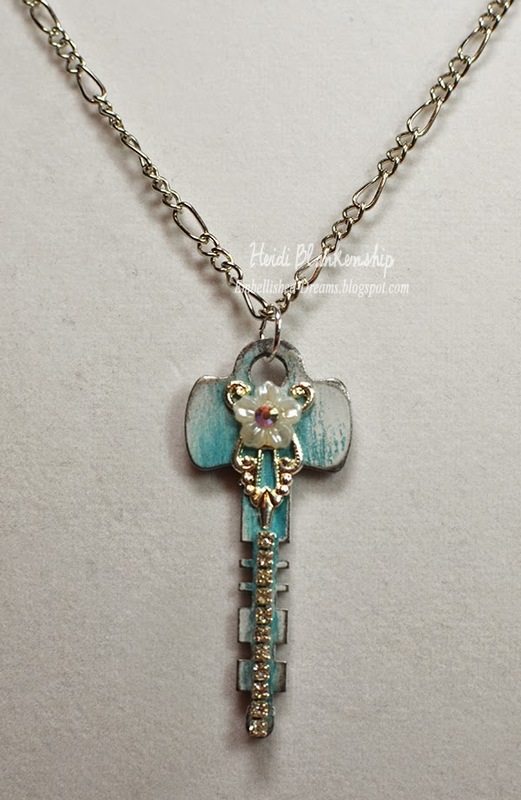 I also painted and distressed the key and added a tiny white pearl flower. 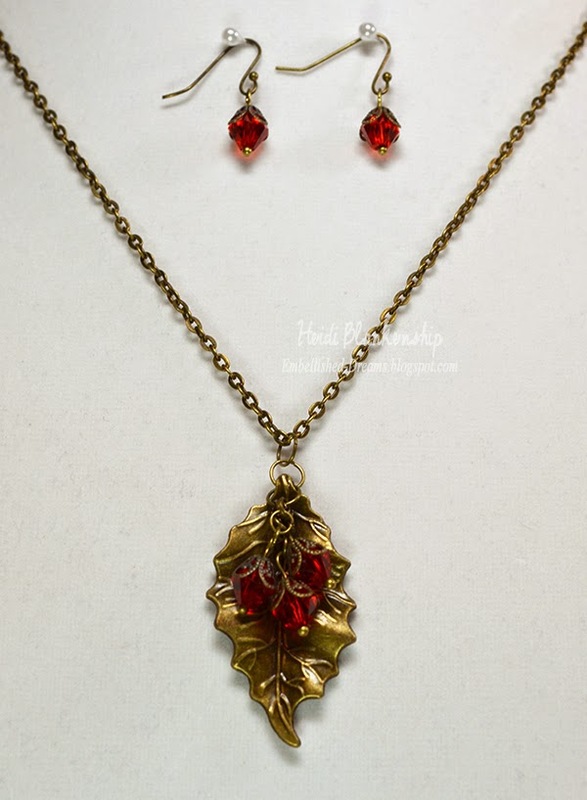 for the third necklace I added Bronze Filigree, SS8 Crystal Rhinestone Chain Trim and a Clear AB SS8 Pointy Back Crystal Rhinestones. I added a Silver Jump Ring and Silver Chain. I also added a tiny white pearl flower. This is one of my favorite ones. The key is so tiny and the design is very simple. 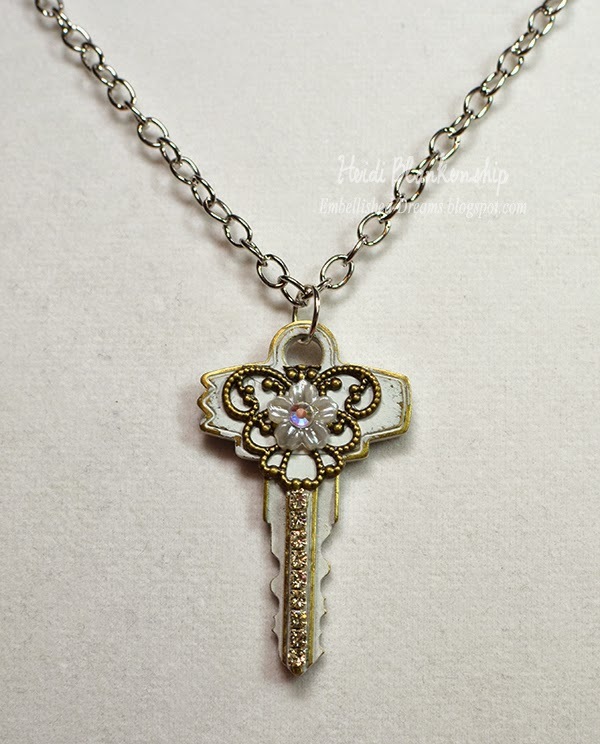 To embellish this key I added a Bronze Tibetan Style Connectors (Item #J375-B), Copper Lock and Key Toggle Clasps (Item #CL543-C), SS16 Clear Flat Back Glass Rhinestones, and a Crystal Charm. The key was added to a Bronze Jump Ring and Bronze Chain (Item #CH779-B). This necklace is another favorite. 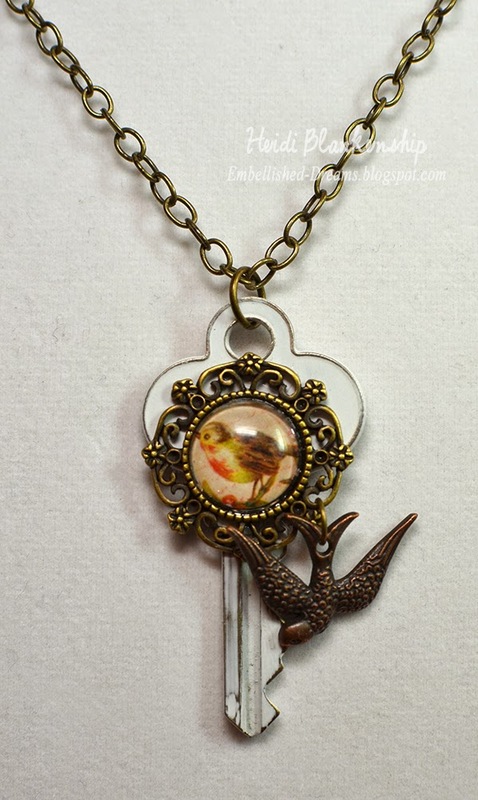 I added a Cabochon that I added a small bird image to and then I added a Bird Charm. I attached the key to a Bronze Jump Ring and Bronze Chain (Item #CH779-B). 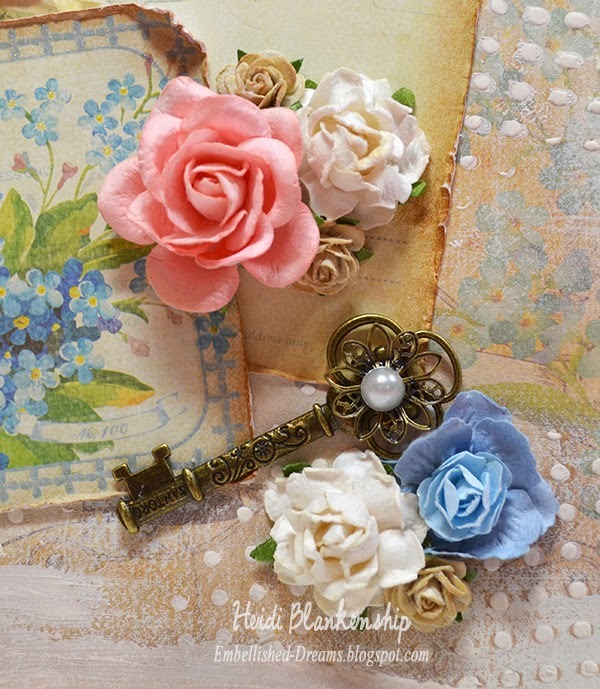 I had a lot of fun creating necklaces with these vintage keys. Here is a list of the vendors that will be at the event. 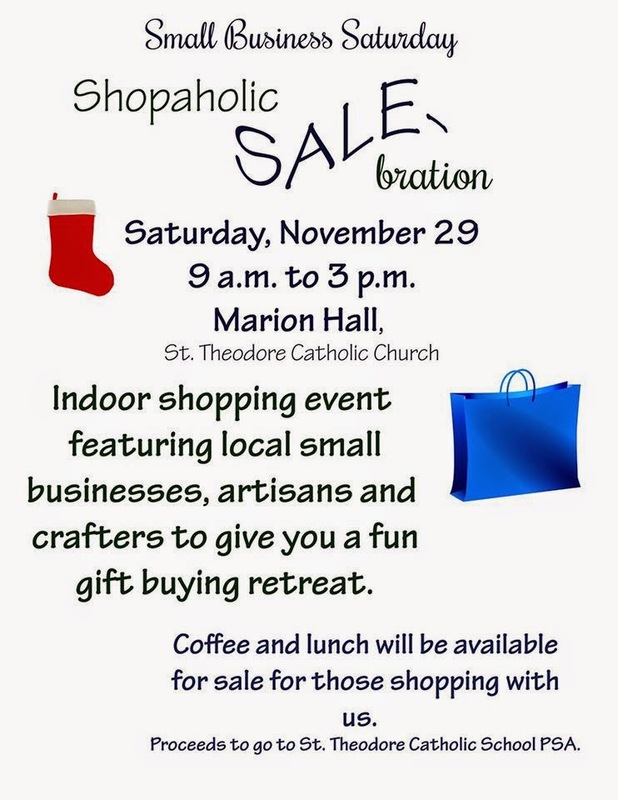 I will have a booth set up at the event and I will be selling, cards, canvases, handbags, jewelry and some Christmas items--all handmade. :) Hope to see you there! Hello everyone! 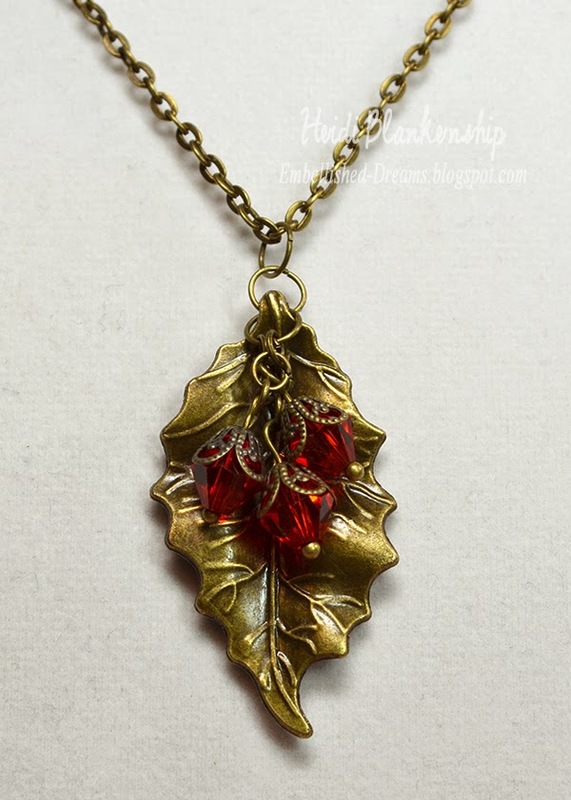 Today, I have a quick post and a jewelry piece to share with you. I have been busy creating and getting ready for a show this weekend. I will be posting all the details tomorrow for the Small Business Saturday show that I will be attending. This is one of the bezel pieces that I recently created. 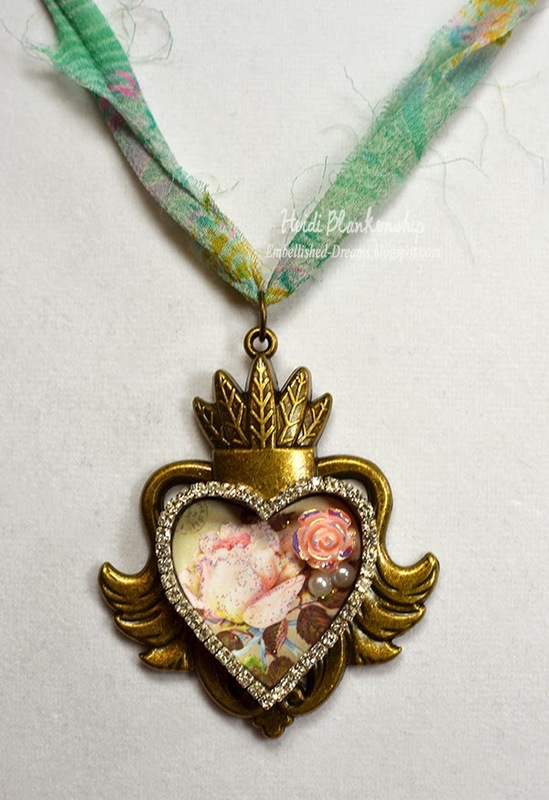 The bezel is GLLB-001G Large Heart Bezel-Bronze that is part of the Gilded Life Collection with Spellbinders Paper Arts®. I added a die cut piece with an image of a rose. 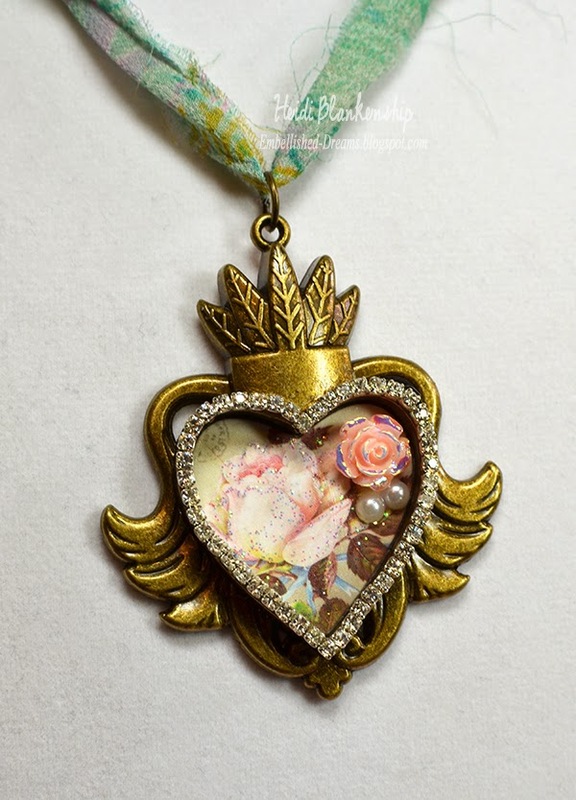 To create the die cut I used the matching die, GLD-001 Heart Dies. I used Mod Podge to seal the image and adhere it to the bezel. Next I added some diamond stickles to the image. You can see a little bit of the sparkle in this photo. 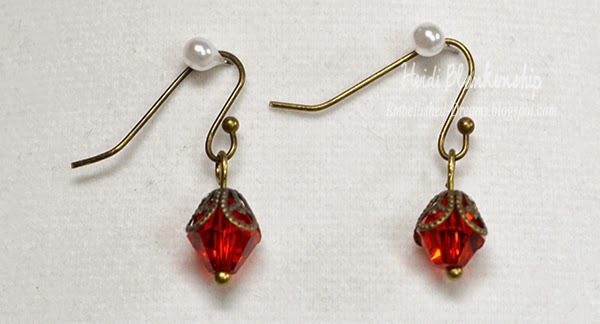 For embellishments I added a pink resin rose, a couple of pearls and some rhinestone chain. 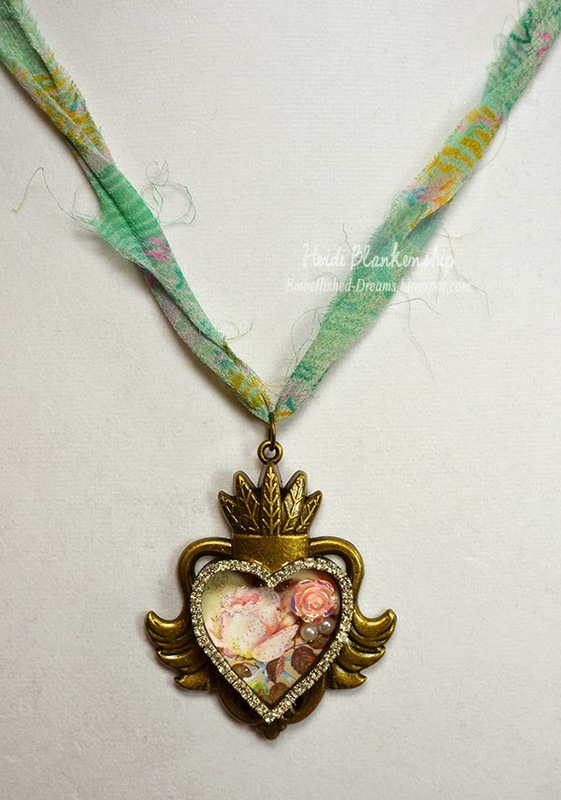 To finish off the necklace I added a jump ring and then added the bezel to a piece of silk. Thanks so much for stopping by today! Don't forget to stop back tomorrow to find out all of the details about the upcoming Small Business Saturday event! Hello everyone! 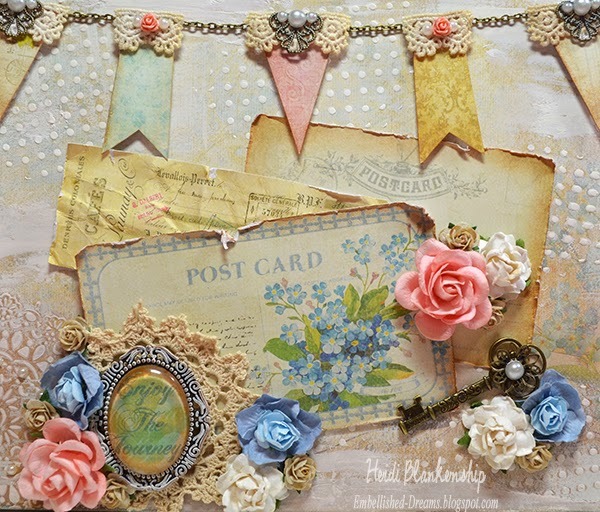 Today, is my day to post for The Stamp Simply Ribbon Store and I have an altered candle and matching card set that is perfect for gift giving. I know we all need quick and inexpensive gifts during the holiday season and these candles with a matching card are easy to make and very inexpensive. 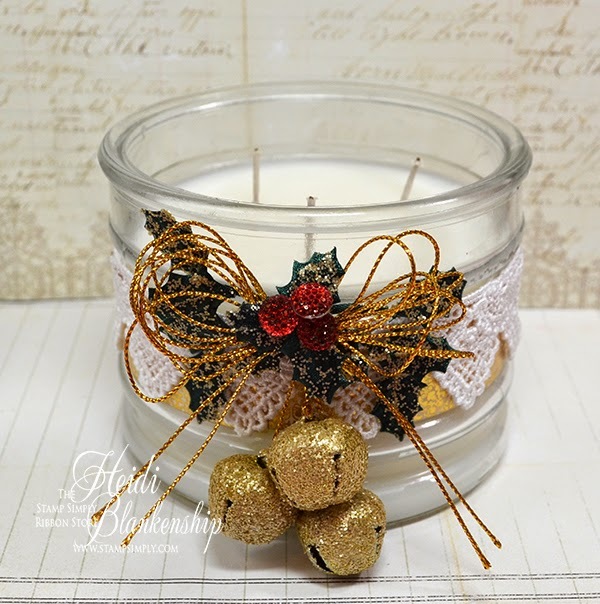 I used some gold foil pattern paper from the Kaisercraft Yuletide 6 1/2'' Paper Pad to make a belly band around the candle and then I added some gorgeous Venise Lace. I used a lot of the same products on both the candle and card. 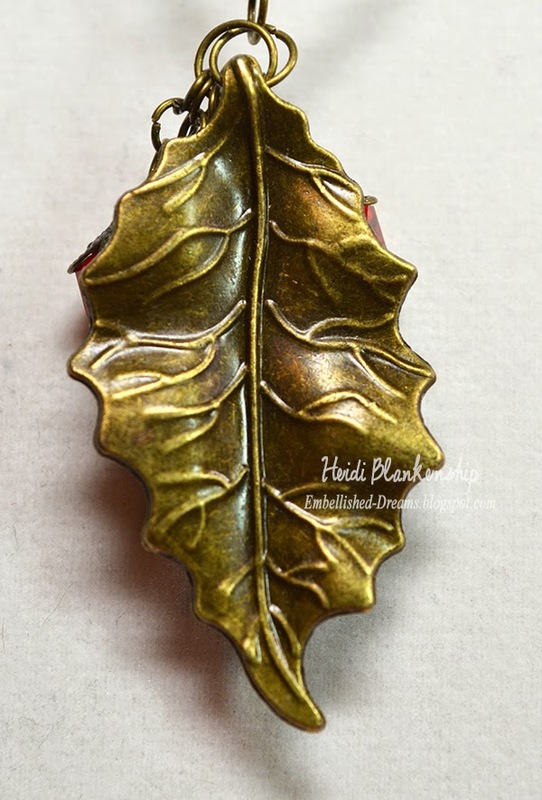 I used some of the May Arts Satin Holly Leaves and I brushed Tombow Mono Multi Liquid Glue on the leaves and sprinkled with Tim Holtz Distress Glitter-Antique Linen. 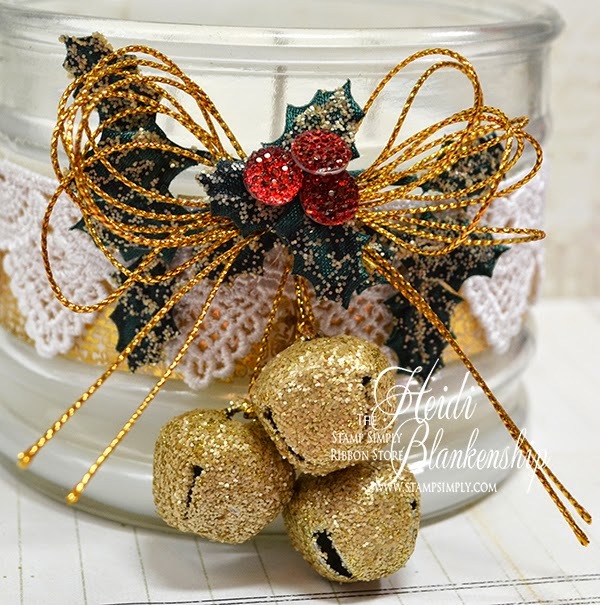 I also added some glitter to the Glitter Jingle Bells - Gold Assorted. 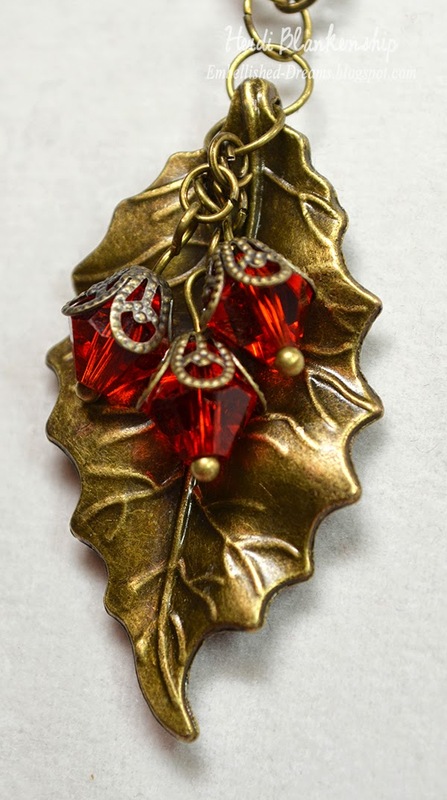 Now these bells already come with gold glitter on them but I wanted to glitter to match the holly leaves so that is why I added more glitter. 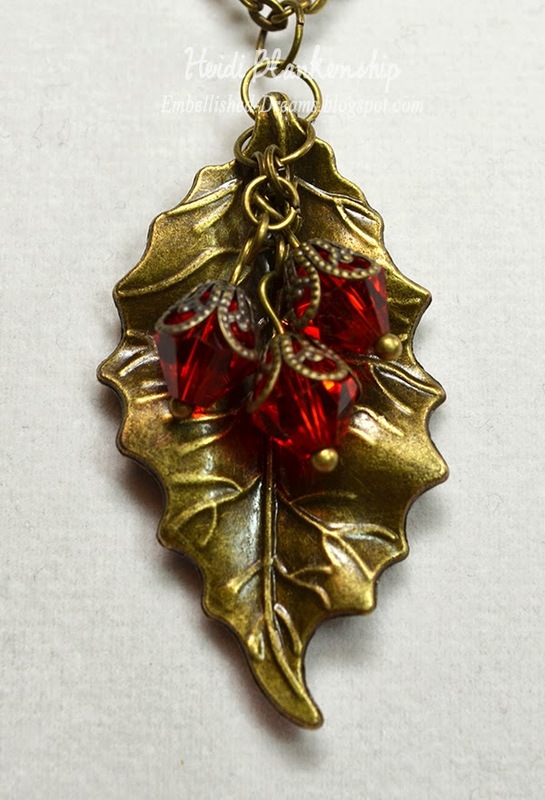 After I added the holly leaves and bells then I added a pretty gold bow made with May Arts Metallic Gold String and the finish it off I added a few Kaisercraft Sparklets-Rouge to look like holly berries. Here is a look at the matching card. I used more pattern papers from the Kaisercraft Yuletide 6 1/2'' Paper Pad. 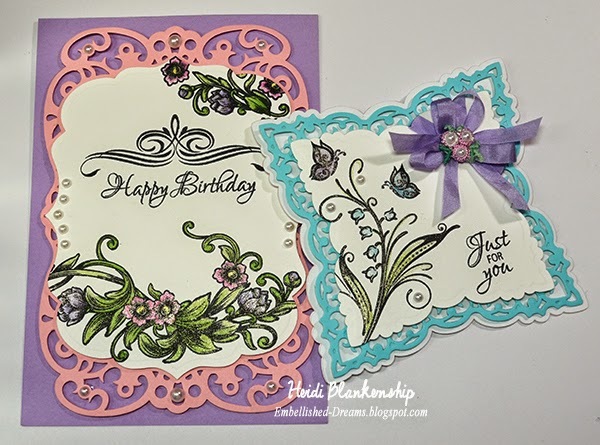 I created two die cuts using S2-120 Spellbinders Die D-Lites - Peace Sentiment, S4-418 Labels Thirty-Six. 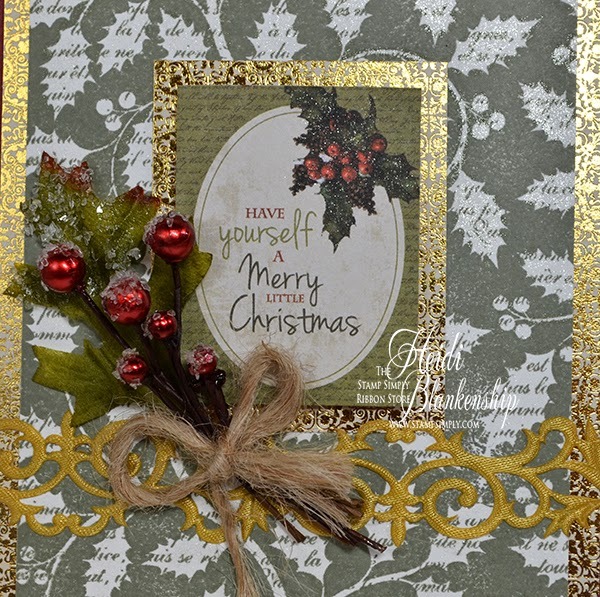 I also used Bazzill Gold Mirror Cardstock on one of the die cuts. Here is a close up of the card. I fussy cut the center image with the sentiment from one of the sheets of paper in the same paper pad. I love using little images like this. JustRite Papercraft - Tutorial Tuesday Watercolor Series Part 4 - Giveaway - BLACK FRIDAY sale! 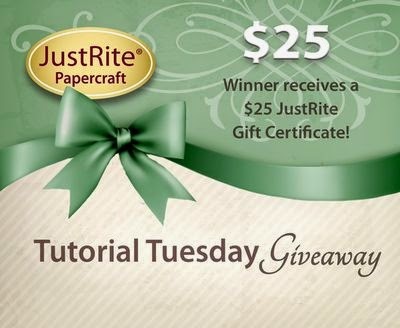 Today, is Tuesday and it is my week to post the Tutorial Tuesday video for JustRite® Papercraft. So while it maybe be cold outside it's a great day to stay inside and craft. For today's video I am continuing with the Watercolor Series and today is Part 4. 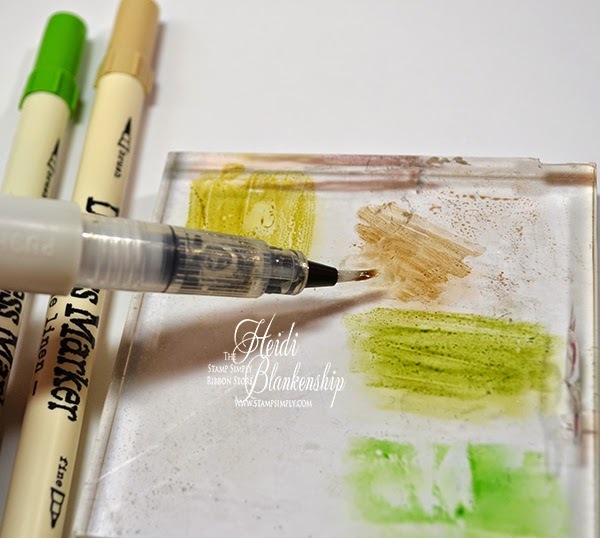 I will be sharing with you how to create a shimmery and very sparkly watercolor look using Tim Holtz Distress Markers and Zig Wink of Stella Clear Glitter Bush Pen. I will be watercoloring stamping images using the New November Releases from JustRite® Papercraft. Here is a look at both of the cards I designed using this technique. Here is a close up so you can see all of the shimmery goodness! I love the Zig Wink of Stella Clear Glitter Bush Pen. 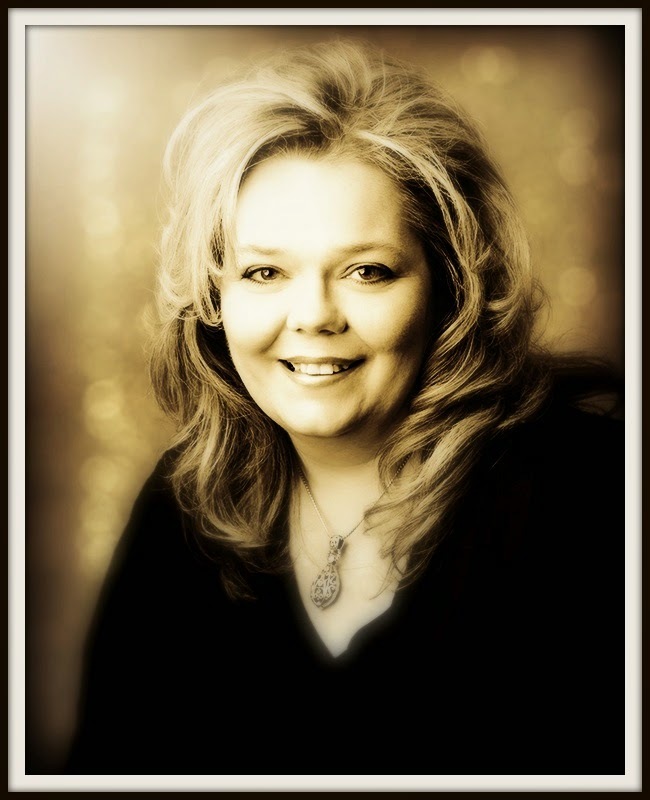 Please be sure to check out the JustRite Inspiration Blog to find out all of the details. I have a step-by-step tutorial with more photos, supply list and a video to share with you. On the JustRite Inspiration Blog!! Simply answer today's giveaway questions - What are you currently crafting/creating? PLEASE LEAVE YOU ANSWERS ON THE JUSTRITE INSPIRATION BLOG!!! You can click HERE to visit the blog. Hello everyone! Today, I have an altered 8 x 10 canvas to share with you. Hello everyone! 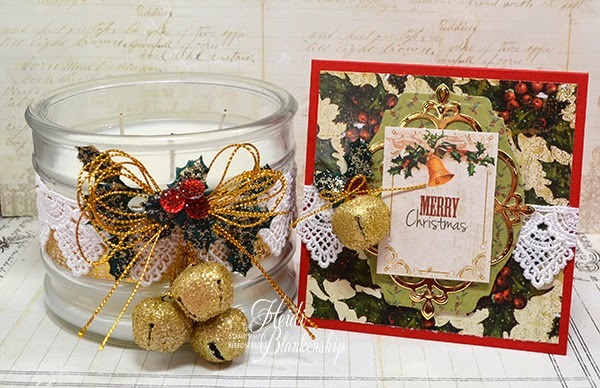 Today, is my day to post for The Stamp Simply Ribbon Store and I have a sparkling Christmas card and a short tutorial to share with you. Here is the card that I designed. 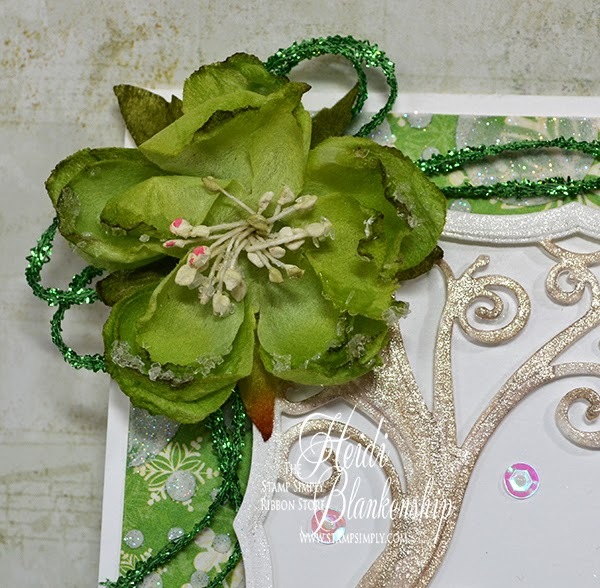 I love all of the layers, texture and sparkle with this card. 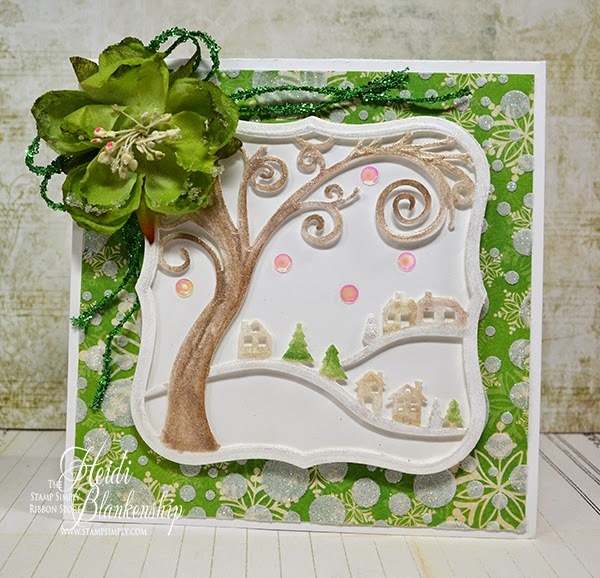 To start I taped down a piece of green snowflake pattern paper from the Graphic 45 Twas the Night before Christmas 6 x 6 paper pad and then I taped the Prima Bubbles Stencil on top and added Studio 490 Embossing Paste - White. 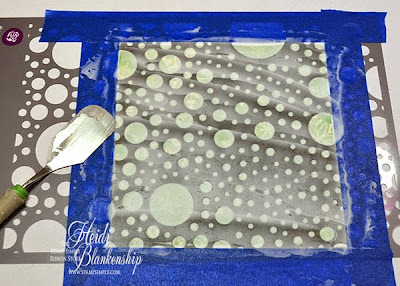 Carefully remove the stencil and then I added Stampendous Crystal Glitter - Ultra-Fine Translucent on top of the embossing paste while it was still wet. Next I used S4-435 Picture Perfect die template to create the die cut. 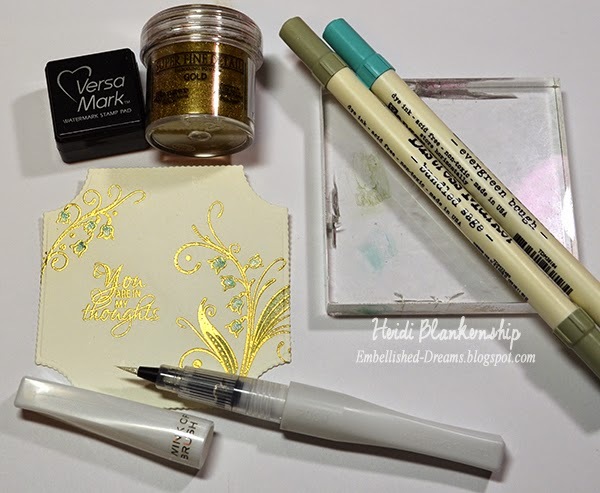 To add the color I used Tim Holtz Distress Markers and Zig Wink of Stella Clear Glitter Brush Pen. 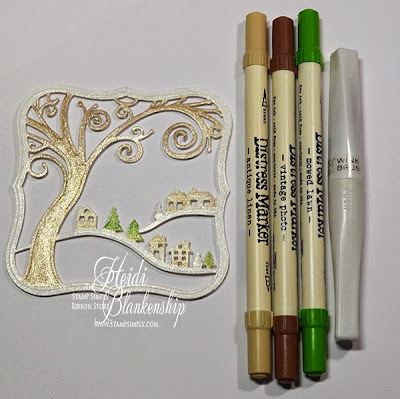 I used an acrylic block to scribble some of the color from the markers and then I picked up the color with the Zig Wink of Stella Clear Glitter Brush Pen and used it the same way you would a watercolor brush and added the color to the image. Here is a close up of the image. Look at all the shimmer! Here is a close up of the embossing paste with the glitter. Even more sparkle lol! To finish off the card I added a few Sequins - Crystal Iridescent - 5 mm, a beautiful Petaloo Botanica Collection Sugared Blooms Green, and a bow with May Arts Metallic String Ribbon-Parrot Green. Hello everyone! 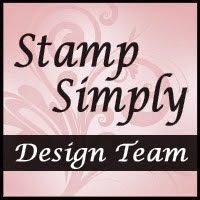 Today, is my day to post for The Stamp Simply Ribbon Store and I have a quick and easy Christmas card to share with you. 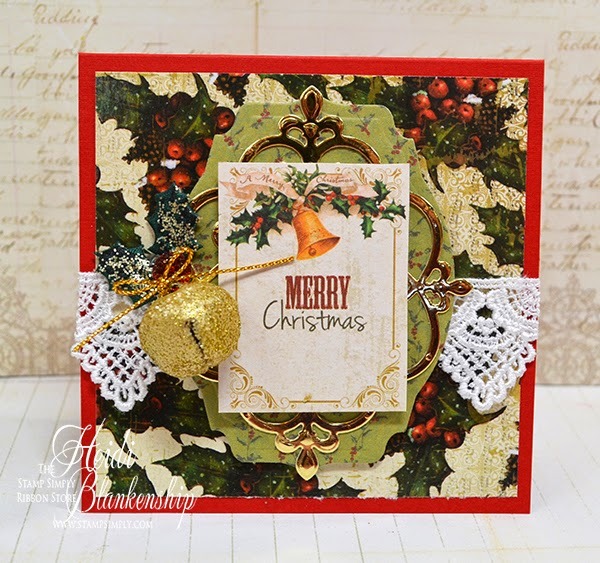 For my card I used some of the gorgeous Christmas papers from the Kaisercraft 6.5 Paper Pad Yuletide. I love it when paper pads have images that can be fussy cut and used to make quick and easy cards. 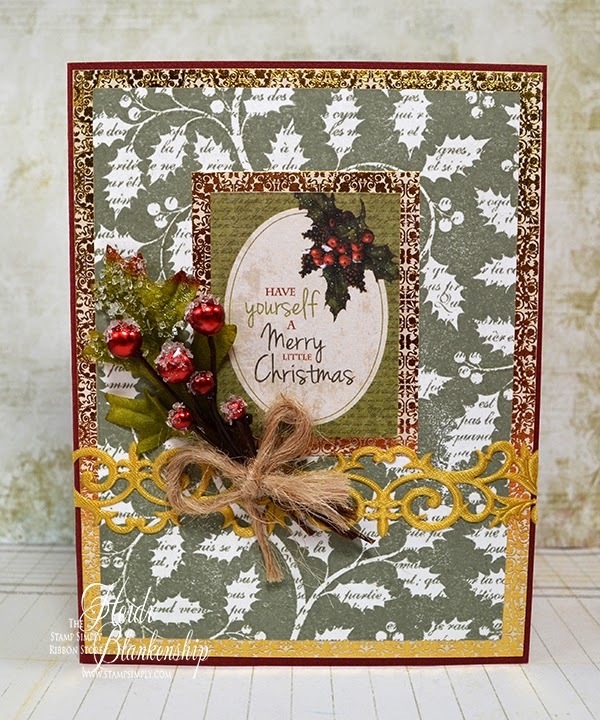 To create the holly leaf background I used JustRite® Papercraft CL-02068 Holly Swirls Background Cling Stamp along with Memento Olive Groove ink. The base of the card is red cardstock. 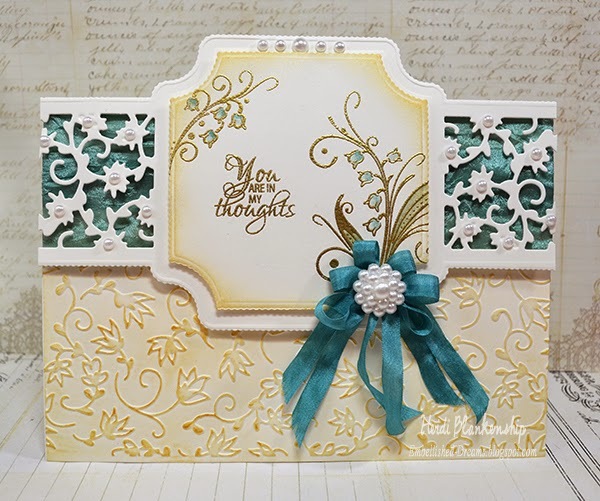 After I stamped the background and cut out the mats and the image the card came together so easily. Here is a close up of the image I fussy cut. I layered the image on top of a piece of the gold foil paper and added 3D Foam Squares for a little dimension. 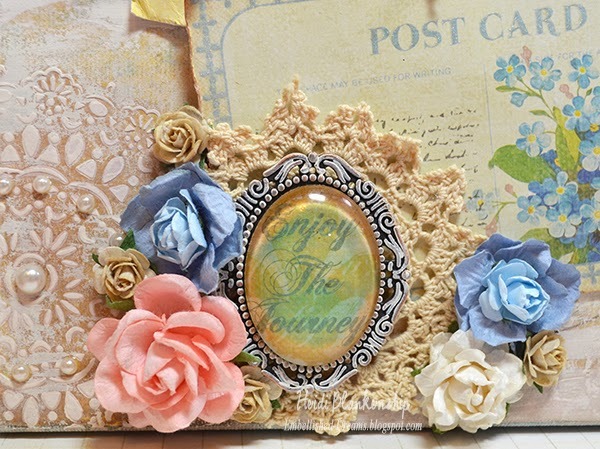 Then I added the beautiful May Arts 7/8" Adhesive Fleur de Lis Scroll - Gold ribbon. The ribbon adheres wonderfully to the paper and adds a touch of elegance. To finish off the card I added one of the Petaloo Botanica Sugared Berry Clusters - Red. The berry clusters have a clear chunky glitter on them so they look like they have little ice crystals and it was a perfect match to the beautiful paper. 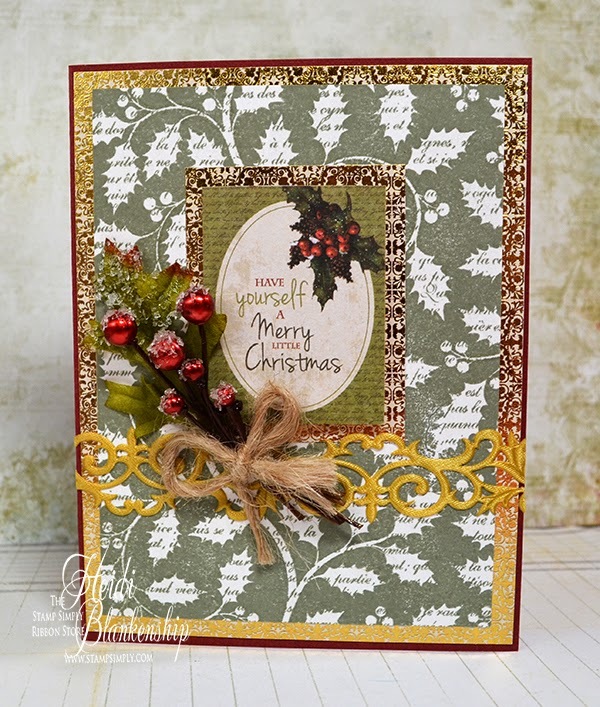 I also wanted to add a little more shimmer to the card so I went over the holly leaves and berries in the background with the Zig Wink of Stella Clear Glitter Brush Pen. So how are you coming along with your Christmas cards? I would love to hear from you and how many cards you make each year. Hello everyone! It's Day Two of the November New Release for JustRite® Papercraft. 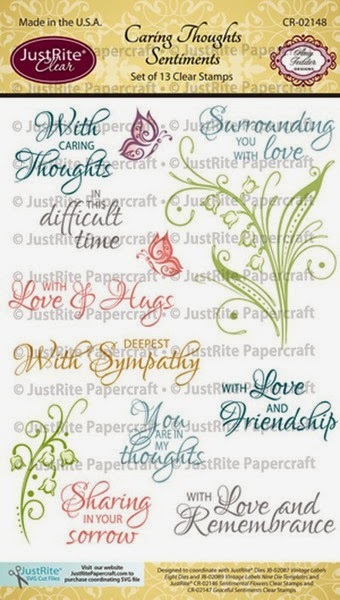 Today we are featuring the CR-02148 Caring Thoughts Sentiments Clear Stamps. This is a beautiful stamp set with a couple of floral and butterfly images and wonderful sentiments. 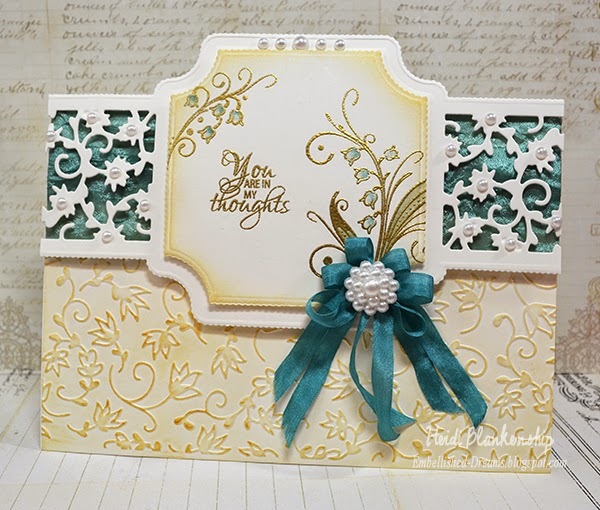 This is the card I designed using the CR-02148 Caring Thoughts Sentiments Clear Stamps. 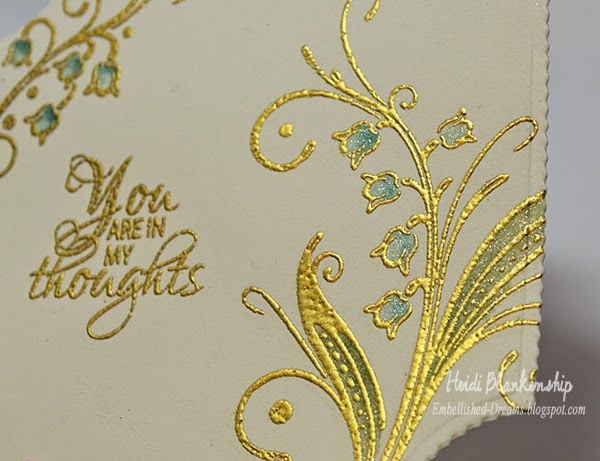 I stamped the floral images and sentiment using VersaMark ink. 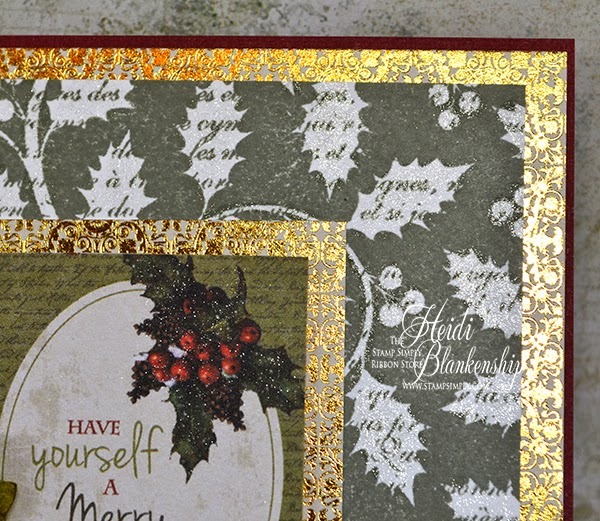 Then I used Ranger Super Fine Detail Gold Embossing Powder and heat set. 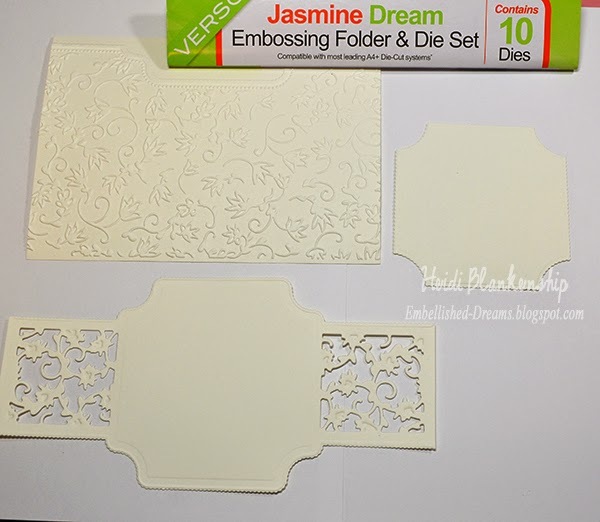 To create my card I used the Idyllics Embossing Folder & Die – Jasmine Dream from Tonic Studio. This is a beautiful die set with 10 dies and it also includes the embossing folder. 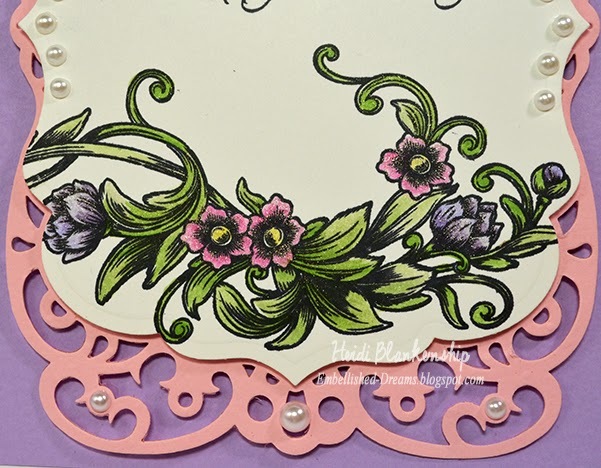 To color the floral image I used Evergreen Bough, Bundled Sage Distress Markers. 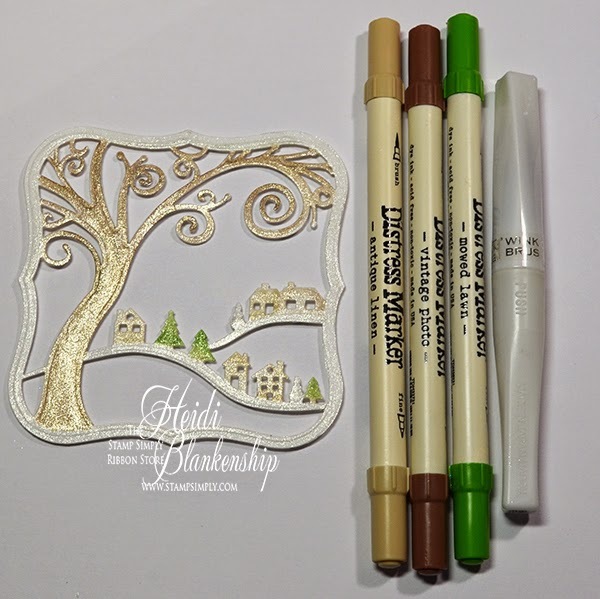 I scribbled the colors on to an acrylic block and then I used the Zig Wink of Stella Clear Glitter Brush Pen to pick up the color and and color the images. Doing this adds so much sparkle and shimmer to the image. Just be sure to scribble of on a piece of scratch paper in between colors. Here is a close up so you can see the shimmer. 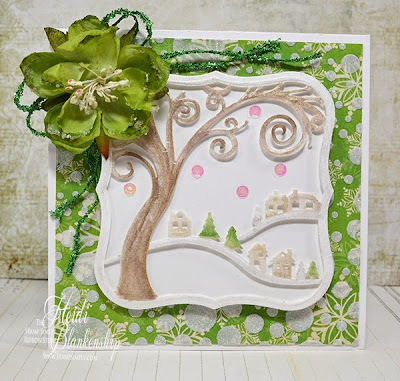 I think the topper for this card is so gorgeous and I love the details. I added some May Arts Green Wrinkled Ribbon behind the die cut for some interest and added color. 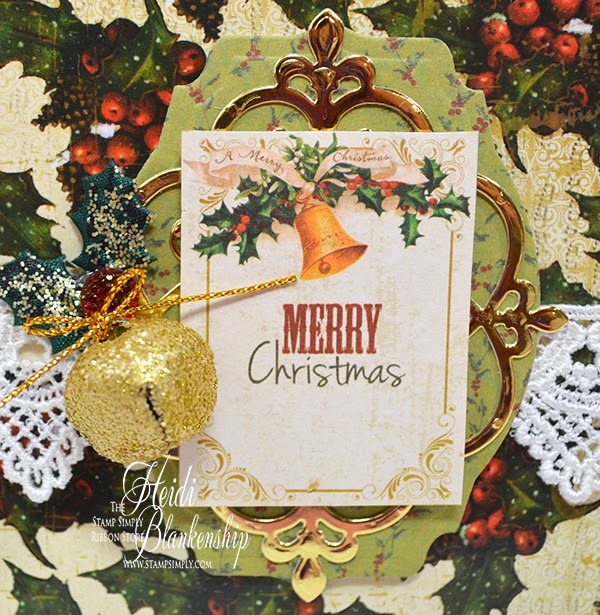 I used a cotton ball and applied Delicata Golden Glitz ink around the edges of the label die cut and also on the lower portion of the card going over the embossing. Doing this really makes the embossed area pop. 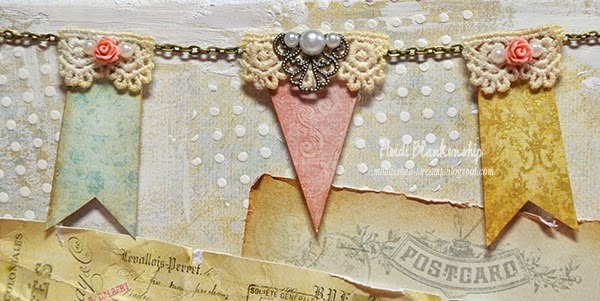 To finish off the card I added pearl button to the center of the bow. I used Teal Silk Ribbon to create the bow. Then I added a few more white pearls. 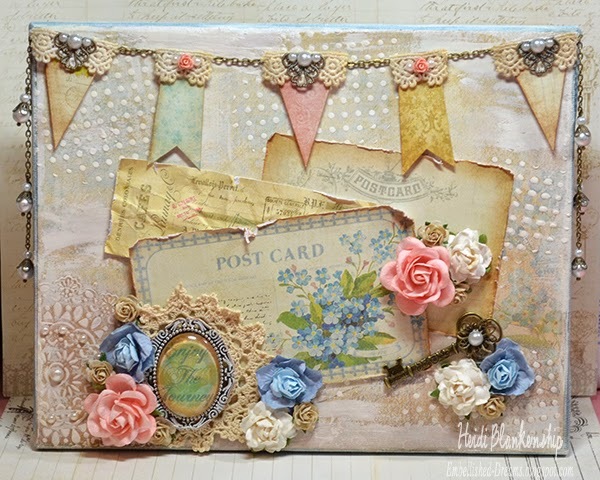 Please be sure to hop on over to the JustRite Design Team Members listed below and check out what's on their blogs using this beautiful stamp set!